In a new study, led by Peter Malin and Marco Bohnhoff of the GFZ German Research Center for Geosciences, the authors report on the observation of foreshocks that, if analyzed accordingly and in real-time, may possibly increase the early-warning time before a large earthquake from just a few seconds up to several hours. Istanbul and the Prince Islands in the background, on which the borehole observatory GONAF is located. However, the authors caution: „The results are so far based on only one - yet encouraging - field example for an ,earthquake preparation sequence' typically known from repeated rock-deformation laboratory experiments under controlled conditions", says Marco Bohnhoff. 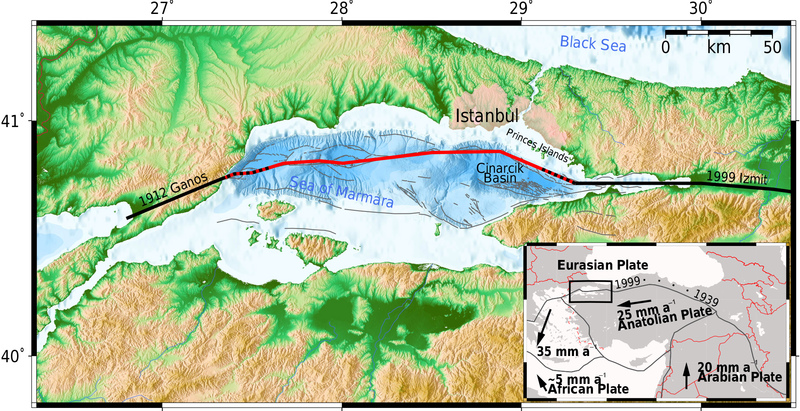 In the latest issue of Scientific Reports, seismic data from the GONAF network, set up by GFZ in collaboration with AFAD along the Marmara Sea near Istanbul, is processed and analyzed with novel processing techniques. The high resolution borehole seismic array allowed for the detection of tens of seismic events prior to the mainshock. These small events would have been below the detection threshold of most seismic networks worldwide. By means of the new processing technique, clustering and similarity of the seismic signals was shown to substantially increase in the hours prior to the Mw 4.2 earthquake. If this so-called emergent failure process would be a persistent feature of seismicity there, implementing real-time processing of the novel technique could extend the warning time for future earthquakes in the Istanbul region and lead to a major improvement in the early-warning system for the densely populated area of the Turkish megacity. "Our study shows a substantial increase in self-similarity of the micro-quakes during the hours before the mainshock," says Professor Bohnhoff of the GFZ; "while the current early-warning system in place in Istanbul relies on the arrival times of seismic waves emitted from the hypocentre to the city and is therefore restricted to a couple of seconds at maximum". While similar precursory activity has been detected for recent large earthquakes in Japan (2011 Mw9 Tohoku-Oki) and Chile (2014 Mw8.1 Iquique), this is at present by no means a ubiquitous observation and needs further testing before its implementation.